Over the weekend I took a drive up Highway 395 to take some photos of Camas Creek and the North Fork John Day River. 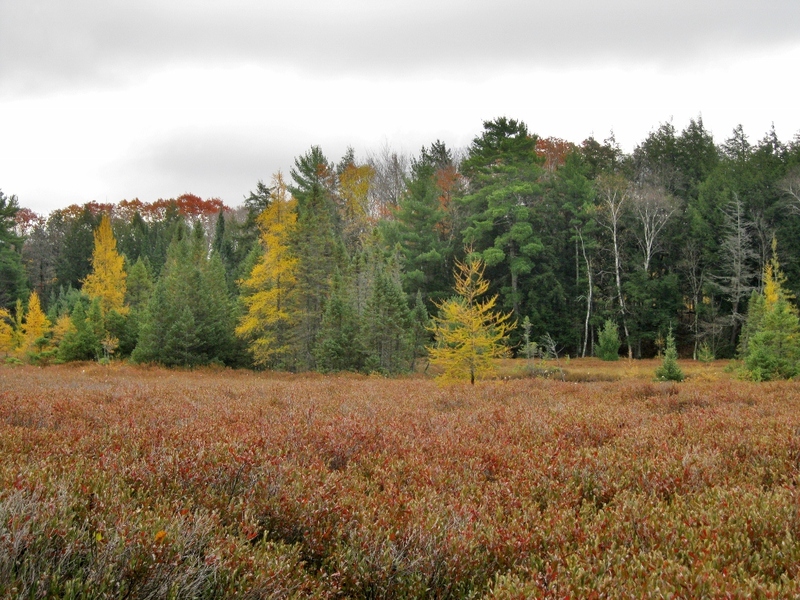 Even here where most of the trees are pines, the scenery manages to look autumnal. 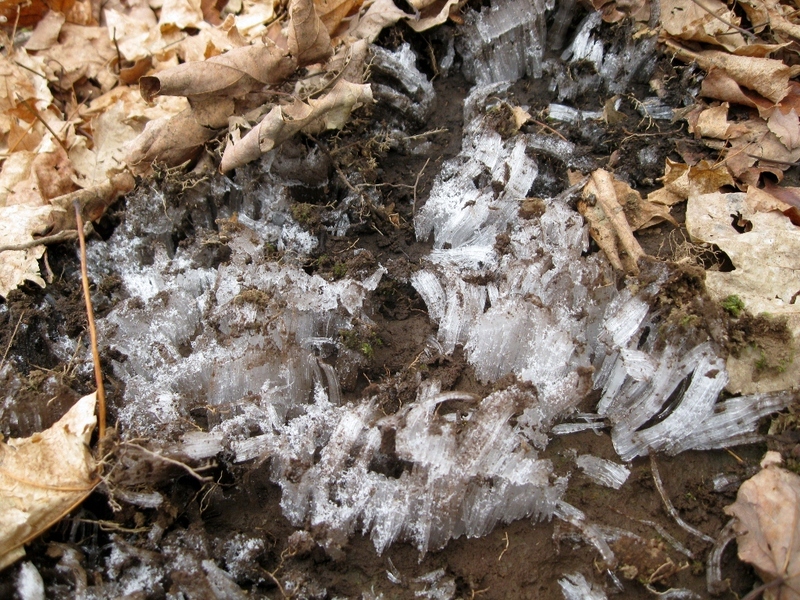 While hiking up to Summit Peak in the Porcupine Mountains this past weekend (not quite as impressive as it sounds; as I said at the time, “peak” is a relative term and we were in Michigan), we came across a patch of mud at the edge of the trail with some unusual ice crystals sprouting out of it. 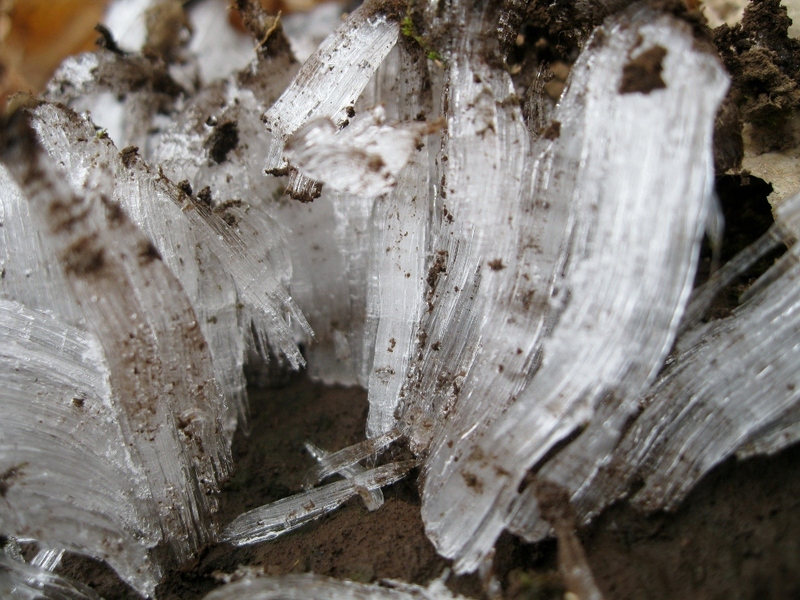 The shape actually reminded us of string cheese, only smaller – delicate curlicues of ice growing out of the surface of the soil. I’d never seen anything like it before, but we found several more patches of them as we walked, all growing out of exposed mud. 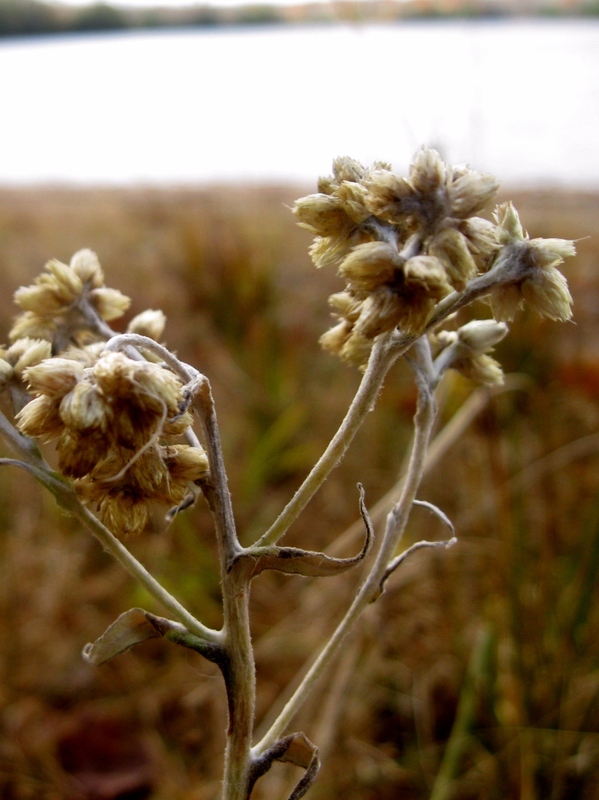 It turns out this phenomenon is called “needle ice.” It only occurs when the air temperature is below freezing but the soil temperature isn’t – in other words, in the fall before the soil freezes for the winter. 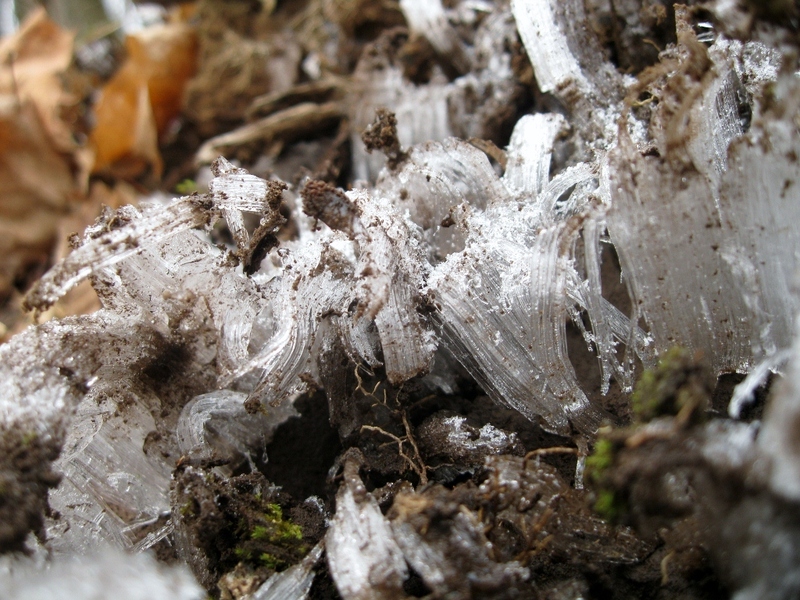 Liquid water in the soil is drawn up to the surface through capillary action and is extruded in columns through pores in the soil as it freezes. This is more or less what we’d guessed was happening. It seems like a lot of people are still posting photos of fall color and even butterflies. 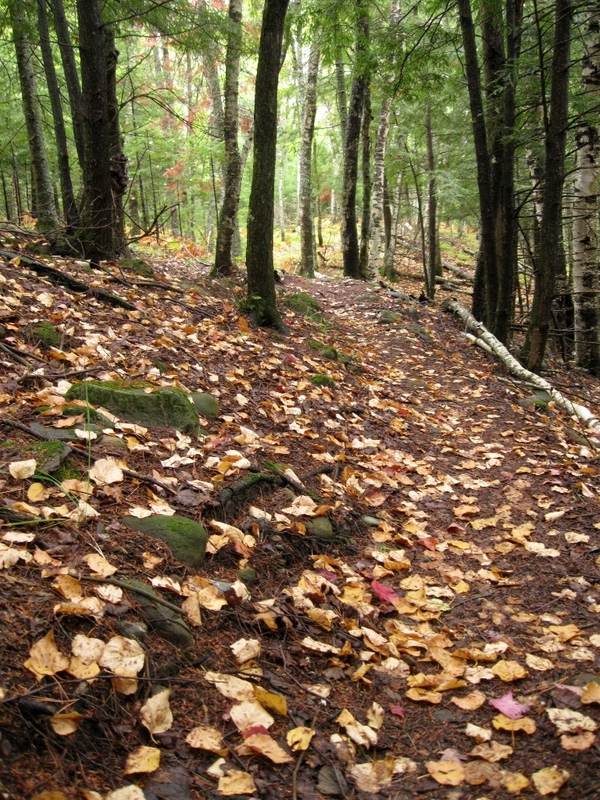 Here in the North Woods, the leaves are already mostly off the leaves, and we keep waking up in the morning to a dusting of snow that melts off by mid-day. The bogs are lovely, though. The golden color of the tamaracks peaks just as the maples, oaks, etc. have lost their leaves. 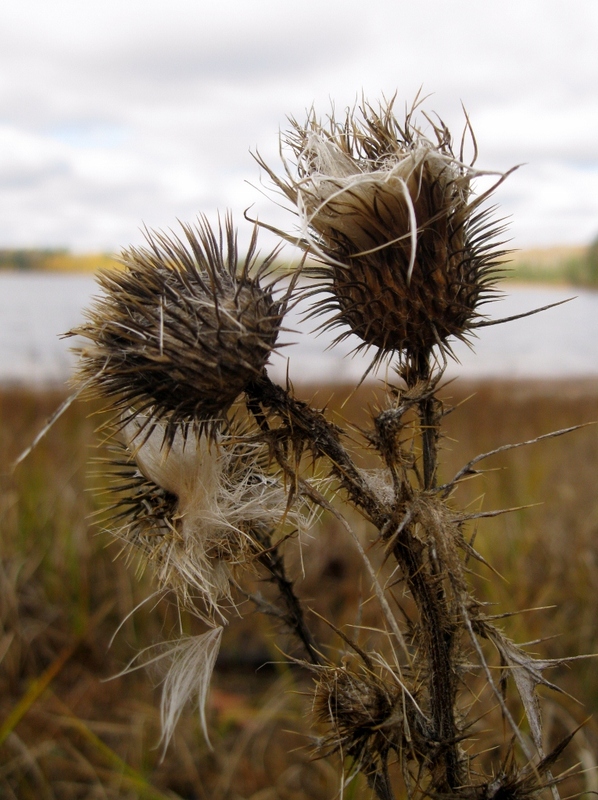 This morning I walked along the edge of one of the lakes and took photos of the seedheads of the various plants I found. I’m being a lazy naturalist and not identifying all of these (a couple of them I already know, but not all). I just like all the shapes and textures. Stocked up on hot chocolate this weekend, dropping my wool coat off today for dry-cleaning – I’m ready for winter. How about you? As the days grow colder, the lakes are getting ready to turn over. 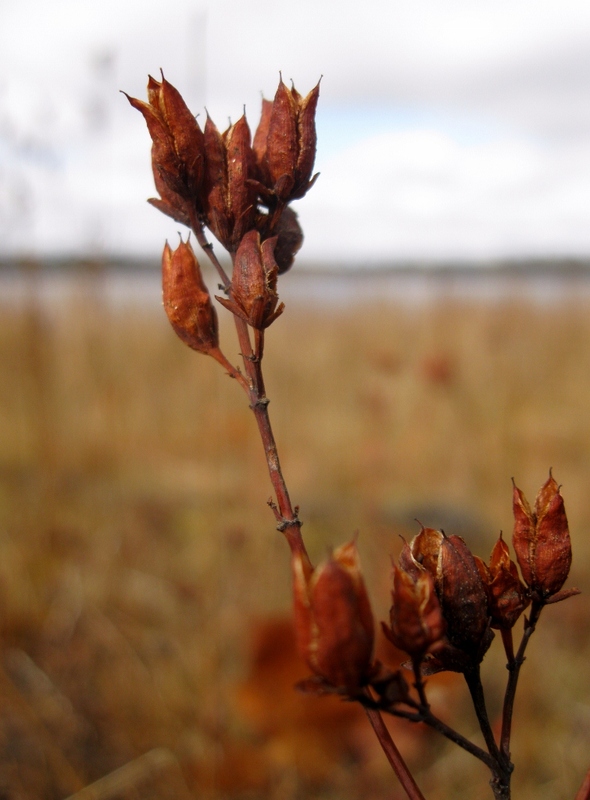 This phenomenon, which happens every fall, is related to the unique chemistry of water. In summer, the water in a lake is typically separated into two distinct zones, separated by a boundary called the thermocline. Near the surface, closer to air and sunlight, the water is relatively warm and oxygenated. Deeper, below the thermocline, it’s colder and contains less oxygen. Because of the different densities of water at different temperatures, these two zones don’t mix much – think of oil and water. If you’ve ever gone swimming in a lake you might have even felt where the water abruptly becomes colder at a certain depth. I’m sure I could find a perfectly good public domain illustration of this online, but it’s so much more fun to make my own in MS Paint. Here’s what’s really cool. Almost any other liquid becomes denser and denser as it cools and gets densest of all as a solid. Water is densest at 4°C or 39°F, several degrees above its freezing point. This is why ice floats – and why lakes freeze from the surface down than from the bottom up. The water under the ice, freshly re-oxygenated from the fall turnover, remains at 4°C all winter long, allowing the fish and other aquatic live to survive until the spring thaw. Yes, this lake is inhabited by goldfish. Stop judging me. There’s nothing like walking over the frozen surface of a lake in the dead of winter and imagining all the sleeping life sealed beneath your feet. This morning we woke up to another dusting of snow… it won’t be long. 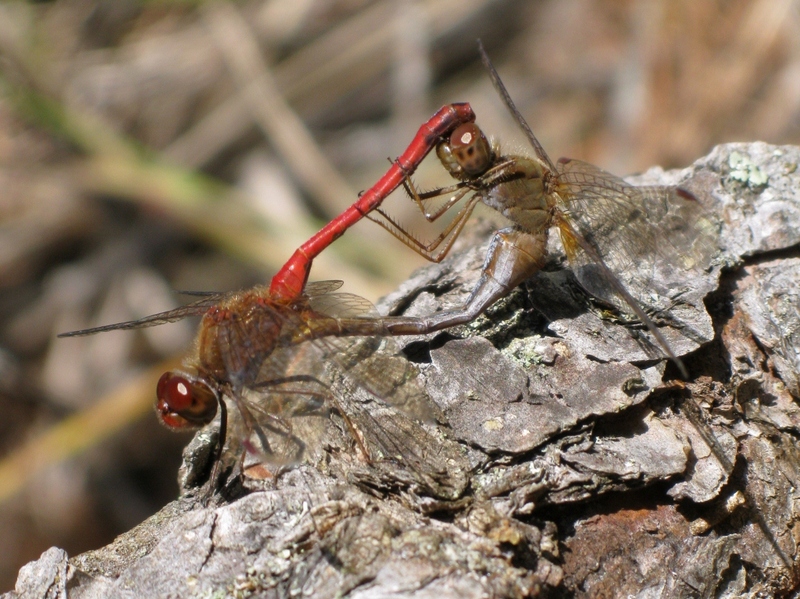 This is a meadowhawk – probably, according to the helpful folks at BugGuide, a Saffron-winged Meadowhawk, although all the dragonflies in this genus look the same to my eyes. 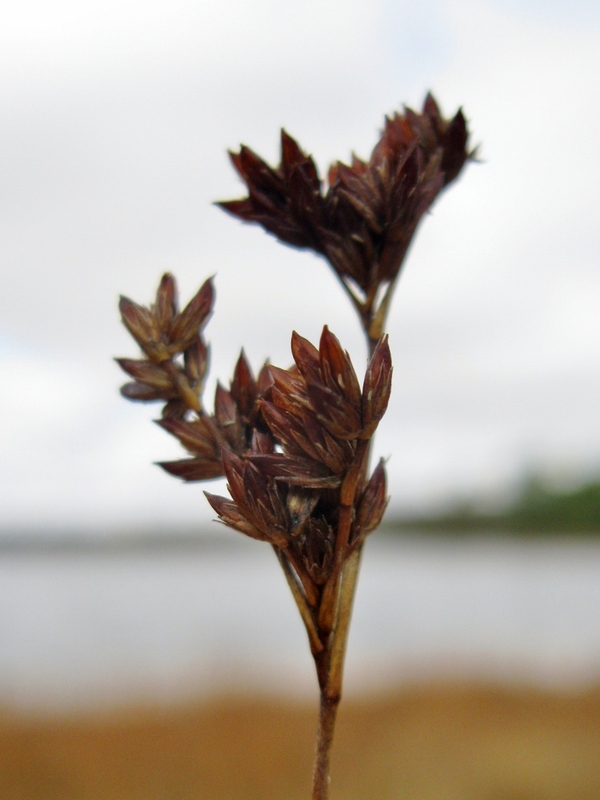 (Apparently this one has “long pterostigma,” which is a word I had to look up. It’s that colored cell at the front of each wing.) 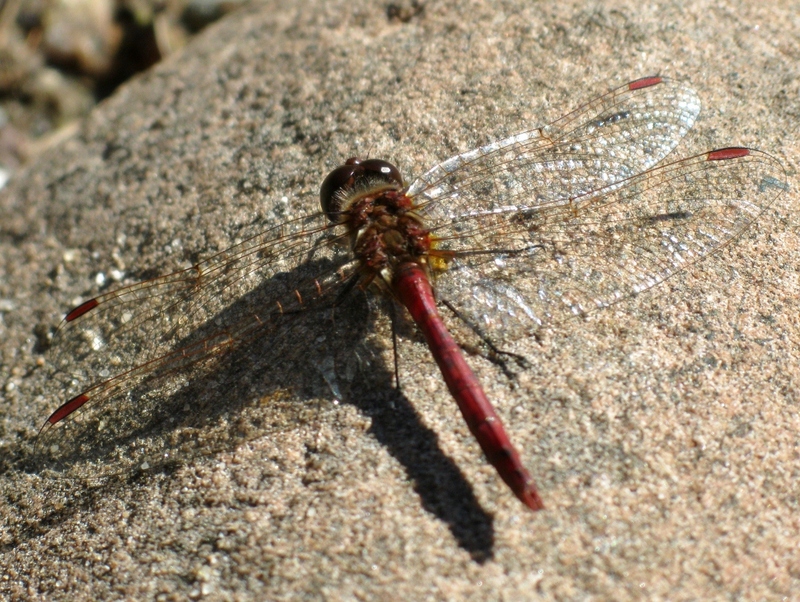 These are everywhere along the edges of the lakes right now, and some of them are hard at work making more meadowhawks. We’re supposed to get three inches of snow tonight. One of the advantages of keeping a blog is that I know exactly when the first significant snow was last year, because I posted photos of it – it was November 9. Much earlier this year! 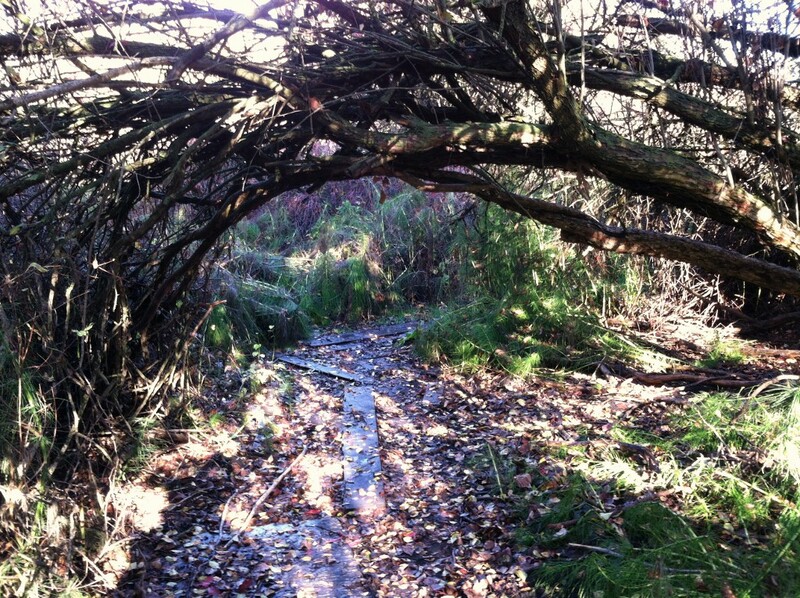 FIRST, a couple photos from my morning walk. It’s a cool, gray, misty day, and autumn is definitely here. SECOND, a reminder that International Rock Flipping Day is Sunday. Participating is easy and fun, whether you have your own blog or not! Details here. THIRD, a week from Sunday I’ll be leaving for a week-long backpacking trip in Porcupine Mountains Wilderness State Park. For work. Don’t you wish you had my job? Anyway, that obviously means I’ll be unplugged from the internet for an entire week, and I thought I’d see if anyone would be interested in writing a guest post for this blog to appear while I’m gone. The requirements would be pretty simple – write a little something (say, 200ish words? but very flexible) about the natural history of the area where you live or somewhere you’ve traveled to, and illustrate it with at least one photo you took yourself. If you have your own blog, I’ll gladly link back to it, but this is also an opportunity for anyone who doesn’t have their own blog but has a favorite photo or nature fact to share. If you might be interested, get in touch with me sometime in the next couple days using the “Contact Me” link above. If I don’t get any takers I’ll either pre-schedule some posts of my own or just let the blog go dark for a week. Not a big deal either way, but I thought I’d throw the possibility out there! Update – I’ve already had about four replies to this, which will be more than enough for a week. Thank you so much!